Researchers have been scouring Mars for water since the early 1970s. Since then, they’ve found frozen water in the poles of Mars as well as trace amounts locked up in Martian soil, but nothing liquid—until this past week. A team of scientists from Italy’s National Institute of Astrophysics announced in Science they found liquid water underneath the glaciers of the planet’s south pole. The body of water is 12 miles wide and a mile underground. Engineer Angel Abbud-Madrid, director of the Center for Space Resources at the Colorado School of Mines, who was not a part of the study, joins guest host John Dankosky to tell us how the researchers found the liquid water and what this discovery means for future Martian water research. And the discovery is particularly well-timed—this summer, Mars will be the closest it’s been to Earth in 15 years. Bonnie Meinke, project scientist at the James Webb Space Telescope at the Space Telescope Science Institute, chats about the best ways to get a glimpse of the red planet. 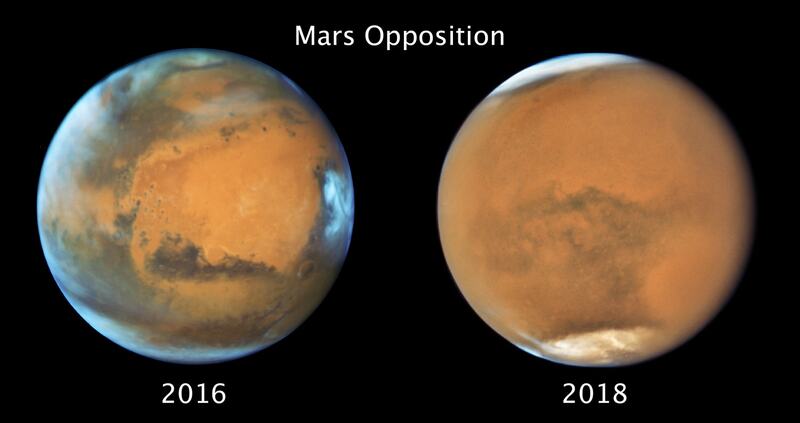 These side-by-side images of Mars, taken roughly two years apart, show very different views of the same hemisphere of Mars. Both were captured when Mars was near opposition, which occurs about every two years, when Earth’s orbit catches up to Mars’ orbit. At that time, the Sun, Earth and Mars fall in a straight line, with Mars and the Sun on “opposing” sides of Earth. The image on the left, taken on May 12, 2016, shows a clear atmosphere. The picture on the right, taken on July 18, 2018, features a global dust storm, with spring in the southern hemisphere. Angel Abbud-Madrid is Director of the Center for Space Resources at the Colorado School of Mines in Golden, Colorado. Bonnie Meinke is Project Scientist for the James Webb Space Telescope at the Space Telescope Science Institute in Baltimore, Maryland. JOHN DANKOSKY: This is Science Friday. I’m John Dankosky. 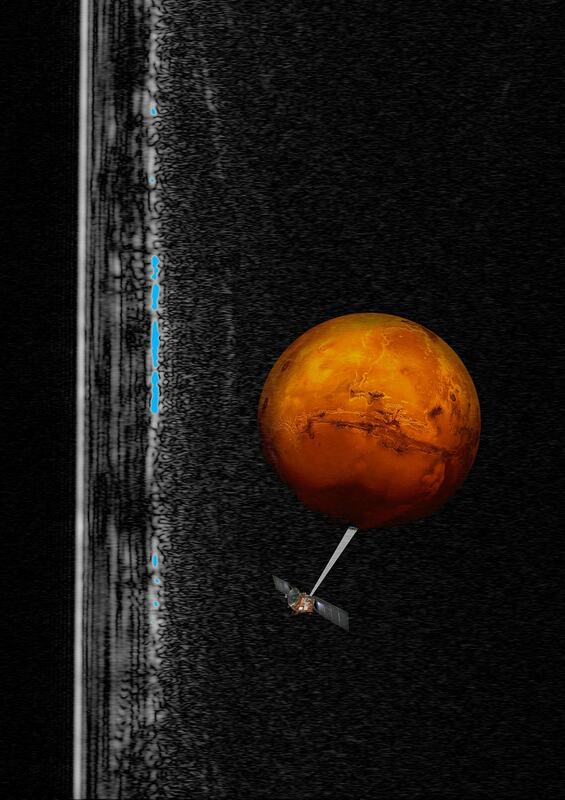 The search for water on Mars has been going on since the 1970s. So far, we found frozen water on the ice caps of Mars, trace amounts locked up in Martian soil, but nothing liquid– that is, until this week. Scientists from Italy’s National Institute of Astrophysics announced that they found liquid water underneath the ice caps on the south pole. It’s not just a little bit of water, either. It’s a lake about 12 miles wide. So what it means for human missions to Mars and future Martian water research? Well, here to tell us more about that discovery is Angel Abbud-Madrid. He wasn’t on the study, but he’s the Director of the Center for Space Resources at the Colorado School of Mines. Angel, welcome to Science Friday. Thanks for being here. ANGEL ABBUD-MADRID: Hello, John. How are you? JOHN DANKOSKY: I’m doing quite well, and I’m interested to talk with you about this. Our listeners might have some questions, too. So if you have questions about water on Mars, you can call us– 844-724-8255. That’s 844-SCI-TALK. Or you can always tweet us @scifri. So this isn’t the first time we’ve found water on Mars, but there’s something big and different about this discovery. Tell us what’s so interesting about this. ANGEL ABBUD-MADRID: Well, the exciting thing about this announcement is the first time that liquid water has been found on Mars. As you mentioned, water has been found as ice on the subsurface– very close to the surface– with the Phoenix lander. And also, 1 to 2 meters were discovered and was announced earlier this year, has also been found as water vapor on the atmosphere of Mars in very low quantities. And water is also trapped on the minerals. But this is the very first time that liquid– a body of liquid water– has been found. JOHN DANKOSKY: Isn’t the south pole of Mars really, really cold? I mean, how come this underground lake isn’t completely frozen? ANGEL ABBUD-MADRID: That’s a good point. It’s a really cold region. You can get down to minus 120 degrees Celsius down there. But think about this body of liquid as putting some antifreeze on that. Not only the pressure of the ice cap on top of that, which is about a 1 and 1/2 kilometers, lowers the melting point, but also, this water appears to be combining with salts of magnesium and sodium and calcium. So it’s salty water. Think about it as a brine. And so that can lower the melting point, and it can exist in the liquid phase. JOHN DANKOSKY: How do the researchers know that this water is salty? Is it just presumed because it’s not frozen? Are there other ways to tell about the contents of this water? ANGEL ABBUD-MADRID: That’s one thing, but the other one is that it may be combined with some of the soil material that is found in those regions. And they’re known to have these types of components, and they have been found in other places on Mars. So that’s the theory. Plus, in order to exist at that very low temperature– which is supposed to be around minus 60, minus 70 degrees Celsius– definitely, it needs those type of materials in order to lower the melting point. JOHN DANKOSKY: There is liquid water under the pole, say, in Antarctica. Is it similar to that? Is it similar to what we see here on Earth? ANGEL ABBUD-MADRID: Exactly, yeah. And in fact, scientists from that mission use some of that data to calibrate their instrument. The instrument up there can receive signals, and they can indicate water. But in fact, it can be compared to what was found on Antarctica, which is very similar when you find bodies of water– of liquid water– below kilometers of ice. So it corresponds very nicely to what was found on Mars. JOHN DANKOSKY: Well, you mentioned the equipment they’re using. What exactly did they use? How did they discover this on Mars? ANGEL ABBUD-MADRID: The Mars Express spacecraft from the European Space Agency has been flying around Mars for almost 15 years now, and it carries onboard an instrument called MARSIS. That is an acronym for Mars Advanced Radar for Subsurface and Ionosphere Sounding– a complicated name. But as the name says, it has a radar– the same type of instrument one uses on control towers to look for airplanes or for submarines or ships. This one happens to be a ground-penetrating radar. And as the name says, the signals– electromagnetic waves– that come up from this instrument can bounce on the surface of Mars, providing a way to look at how the topography of the terrain is– sort of like an altimeter. So those electromagnetic waves can actually penetrate through the surface. And as they go through that, they can distinguish between different types of layers. If it is bedrock, the signal that bounces back will be different from ice, will be different from water. And so by looking at the reflection– the magnitude of the reflection– how bright it looks on the instrument, you can tell what type of medium is that. And this team has been extremely resourceful and very persistent. For three years, they have been looking at the signals, making sure that they can correlate with the signal of water, and that’s what they announced just yesterday. JOHN DANKOSKY: How deep is this pool of water, do they think? ANGEL ABBUD-MADRID: They seem to think it’s about 1 and 1/2 kilometers. This instrument has access in a lower frequency. That means it can penetrate to kilometers. And they saw the signal bouncing from about 1 and 1/2 kilometers. And they measured the depth of this lake, which is a very shallow lake. It’s about 1 meter, so it’s a very– it’s not really a lake. It’s just a pool of water of 1 meter. But it’s, like you said, 20 kilometers across, so it’s significant. JOHN DANKOSKY: OK, so it’s pretty far down there, but then it’s only a pretty shallow pond once you get all the way to the water. JOHN DANKOSKY: I want to get to a phone call. Austin is calling from Casper, Wyoming. Go ahead, Austin. What’s on your mind? AUSTIN: Hey. I was just wondering, what are the chances of getting any water samples from Mars back to Earth in the near future, and would it be more cost-effective to study those samples on site, rather than ship them back and have us study them here? JOHN DANKOSKY: Great, great questions. Angel, what do you think? ANGEL ABBUD-MADRID: Absolutely. Sending anything to Mars is extremely– not only costly, but it’s very energy-intensive. Getting down to the surface, drilling– that is a very difficult thing to do. But there is a mission that actually is being planned to bring samples to Earth. Not necessarily of water. This will be of soil that is found on Mars. Some of it, by the way, that has some water content. Some regular soil that is found on Mars on the surface has about a 1% to 2% of water. Some of it– think about gypsum– has up to 20% of water. So these are actually places where we can find the water if you just heat them up. But actually getting water– the one that was discovered earlier this year is about 1 to 2 meters. So that’s a reasonable depth to drill, find the water on site, measure it there, and then send the signal back to Earth without having to bring it. I mean, they were able to find out that it was water. Why not just drilling, obtaining it there. They can measure the composition and send the signal back to Earth without having to bring it all the way down here. JOHN DANKOSKY: Because this is an awful lot of water in this lake, what do you think it tells us about other water on Mars? You’ve already explained how you can find water in the rocks or in different other parts of the planet, but does it tell you that there’s much more water somewhere that we just haven’t found? ANGEL ABBUD-MADRID: Oh, absolutely. I mean, this may seem like a big lake, but the subsurface ice that was found earlier this year– this is comparable to Lake Superior, basically. So there’s plenty of water ice. The one that was announced yesterday is liquid water, but water ice, it’s– I mean, you can see it on the poles– the ice caps. There’s vast amounts of water ice. It’s just that the one that was found was liquid. But you can find water ice subsurface in very, very large quantities. JOHN DANKOSKY: Now, whenever water is found someplace like Mars, people immediately jump to, well, does this mean that there’s life there? But you’re really fascinated by this water for other reasons. What do you want to know, personally, in your research about this water? ANGEL ABBUD-MADRID: You’re exactly right, John. Every time. It’s great to find water on Mars no matter how you find it. Most of the time, it’s for scientific reason. It’s good to know where the water is, how it evolved from a wet planet to what it is now– dry. Where did the water went– go? So it’s an important thing to find, scientifically. Life is another reason why we should be excited about this, because there may be microorganisms that were preserved on this liquid water. But as far as I’m concerned– and for my colleagues at the Center for Space Resources at the Colorado School of Mines– as the name of our center says, we are interested on water as a resource– something that can be utilized for missions where humans once will have a base on the surface of Mars. Anything that we can use from Mars that cut our dependence from Earth– sending anything from Earth is extremely energy-intensive, extremely costly. And so utilizing anything from Mars will be very useful. Also, recycling whatever the crew is going to use there. But water– the importance of having water on Mars is obviously for human use– for drinking, for growing plants, for shielding them against radiation. But the most important use is that you can split water into hydrogen and oxygen– the most energetic propellant that actually is used on rockets. Also, water can react directly with the carbon dioxide of the atmosphere and combine to give us methane and oxygen– also very powerful propellant. And the use of that is that you can use it for the vehicle that will actually bring the crew back. So you don’t have to take all that fuel all the way to Mars so that it can come back, and that will make it more cost-effective, and also use less amount of energy. JOHN DANKOSKY: So you’re really interested in this as potential rocket fuel– making something that’s going to get people either further out into space or back from Mars once they get there. ANGEL ABBUD-MADRID: Right. I mean, you could use the propellant to even have a hopper. I mean, you can go from one place on Mars to the other one. The fuel to bring you back. And yes, you can probably, at some point, use it to propel you to other places in the solar system. JOHN DANKOSKY: [? Sean ?] tweets at us, do you think that this discovery will drive renewed interest in attempting a Mars trek? Because the American space program has gone back and forth about where we’re going to go next and whether or not Mars is on our radar. So do you think finding water– a big lake like this on Mars– is going to excite people to go back? ANGEL ABBUD-MADRID: Yes. In fact, NASA’s quite excited about this. Two years ago, it had a big meeting looking at possible landing sites for humans. And this will be a base that will hold four to five persons that will be visited repeatedly. And one of the important things that NASA is looking at– what is the optimum site, not just for scientific purposes– a place that is very geologically interesting– bu that will have the resources to keep the crew there? And I think NASA is realizing that using the resources from the planet will be a must if we want to have humans there. And the purpose is to have humans in the next, I don’t know, 15 to 20 years. And they will be using the resources on Mars. So having an announcement like this is quite exciting. Obviously, it all depends where the water is. It’s all about location, location, location. This discovery was done at a very high latitude– about 81 degrees south. And so these are places that are extremely cold, very long winters, maybe not ideal for a human base. But the discoveries of water ice at lower latitudes are quite exciting, the water is just a couple of meters down. And so you can extract it from the ice and have it ready for a Mars base. JOHN DANKOSKY: I have to say, you do sound excited about it. Angel Abbud-Madrid is from the Center for Space Resources at the Colorado School of Mines. Thank you so much for talking with us about it. I really appreciate it. ANGEL ABBUD-MADRID: Thank you so much, John. JOHN DANKOSKY: I’m John Dankosky, and this is Science Friday from WNYC Studios. Now, if you want to see Mars ice caps yourself, you can get a glimpse tonight. The dusty red planet will be the closest it’s been to Earth in 15 years. To talk about the best ways to spot the planet is Bonnie Meinke. She’s a project scientist at NASA’s James Webb Space Telescope. Bonnie, welcome to the show. BONNIE MEINKE: Hello! Nice to be here. JOHN DANKOSKY: This is the closest Mars has been to us in nearly two decades. Why is it so close right now? BONNIE MEINKE: Well, it’s in opposition, which means that if you were to draw a line from Mars to the sun, it would intersect the Earth. So we are at the best location in the Martian and Earth year, where they both align. And they’re the closest to each other that they will be. Now, why it happens– the closest in the 15 years is because they’re on circular orbits, but those circular orbits don’t quite overlap at the very center of those orbits. So the Earth is a little bit farther out, and Mars is a little bit closer in. So that perfect alignment just happens this weekend. JOHN DANKOSKY: If I go outside to look for Mars, where exactly should I be looking tonight? BONNIE MEINKE: You’re going to want to look to the southern sky. You will see a big, bright, pretty full moon. And you’ll look just to the south of it and a little bit to the right as you’re facing south. You should see a nice, red spot of light that doesn’t twinkle– that’s how you can tell it’s a planet– and that is Mars. You might see another bright, non-twinkling spot of light, and that will be Saturn– a little bit farther to your right. JOHN DANKOSKY: Now, with the naked eye, I’ll be able to see it maybe a bit brighter than usual. But if I’m using, I don’t know, just binoculars or a cheap telescope, what will I be able to see? BONNIE MEINKE: Oh, that’s really exciting. So you can take those outside, and you’ll be able to see some of the poles. Right now, Mars is in a global dust storm. So what you’re going to see is a little bit of white at the top, a little bit of white at the bottom, and everything else will be a orange color from that dust storm. But you’ll definitely be able to pick out the polar ice caps. JOHN DANKOSKY: So a dust storm, so you’ll actually be able to see them? What will that look like? Does it make Mars all fuzzy? BONNIE MEINKE: It does. It’s funny. We’ve seen dust storms every few years– something like six to eight years, we see these global dust storms erupt on Mars. And every time, it covers up all of the big, interesting features on Mars. But the dust storm itself, while fuzzy, is very interesting for us, because it means that we’re tracking weather over time. As you track weather over time, you get to learn a little bit more about climate. So we’re becoming weather meteorologists for other planets in our solar system. JOHN DANKOSKY: And NASA released new photos of Mars with these dust storms. Is there some really great detail on there? BONNIE MEINKE: There is. So the Hubble Space Telescope looked at Mars last week to check out this global dust storm. You can still see some surface features, because it’s Hubble, and it has really good resolution. You see a little bit of dark spots on the surface from canyons and other features. But really, the thing to watch for are these dust storms and how they are moving and changing. It’s remarkable to compare them with previous years. So if you look at, say, 2016, where there wasn’t a dust storm, you can see what a difference this makes and how it really takes over the entire globe. JOHN DANKOSKY: Oh, we’re excited to take a look. As a matter of fact, we’ve got those NASA photos of the dust storm on Mars up at our website– sciencefriday.com/marsdust. Thanks so much, Bonnie. I really appreciate your time. BONNIE MEINKE: Yes, it was great talking with you.